Are You Up For The Challenge? 16 Minutes but It’s Still a Mile, right?!?! After all of the injuries and set-backs I have had over the last two years I feel like I am finally better and able to start running again. Clearly, what I have been doing isn’t working so I have decided to try a new approach…heart-rate training. I had a few runs this past summer in which I utilized heart-rate training, and they went really well (not sure why I stopped). I have some ambitious goals for this year, the biggest of which is running my first marathon in October, so I needed to find a plan that works for me. I had heard about Dr. Maffetone and the Maffetone Method previously, but hadn’t looked into his books. I decided to buy and read his book “The Big Book of Endurance Training and Racing.” I think of all the running related books I have read, this one really hit home for me for a number of reasons: I have terrible, terrible eating habits that I have developed over 33 years; I have no endurance when it comes to running; I have never been able to run faster than 12:00-13:30 minutes per mile; I can’t seem to lose weight; I have been dealing with what I believe to be edema; I feel like I have chronic inflammation going on in my body; and I have dealt with my fair share of injuries over the past two years. All of these things are feeding off of each other, putting my body through a very vicious cycle. MY PERSPECTIVE— BY MARIANNE DICKERSON In 2009, Running Times magazine wrote, “Marianne Dickerson is a good candidate for the title of the Marathon Medalist That History Forgot.” The only American woman ever to win a World Championship marathon medal, she took the silver in 1983 in 2: 31: 09. It was only her third marathon. Now retired from road racing, Dickerson prefers competing in Ironman triathlons as a sub-twelve-hour enthusiast. In 1974, as a fourteen-year-old freshman, I began running as a member of my high school track and cross-country teams. I quickly excelled as a middle-distance runner competing in the half-mile and mile events. The improvement I made during my four years of high school competition was dramatic, primarily driven by high-intensity interval training during the the competitive season. I continued my track and cross-country career as a college scholarship athlete training year-round. During the course of my college career, I migrated toward longer distances, competing in races up to ten kilometers. As a result, both my weekly mileage and intensity continued to increase. My training paid off as I achieved collegiate all-American honors in both track and cross-country. Following graduation in 1983, I decided to train for the marathon with ambitions of making the U.S. Olympic team in 1984. My training intensity and mileage continued to increase, with my typical training week consisting of over 100 miles with two days per week dedicated to intense interval training on the track. My improvement over a six-month period from January 1983 to August 1983 was nothing short of miraculous. I competed in the 1983 Avon Woman’s Marathon Championship in May of 1983, placed third, and qualified for the USA Track & Field team to compete in the first ever World Championships of Track & Field. Ten weeks later, I competed in the World Championships in Helsinki, Finland, and placed second (quite an accomplishment for a twenty-two-year-old newcomer to the sport of marathoning!). I was literally “on top of the world” after signing a contract with one of the leading running shoe companies, thinking this was just the beginning of a promising career as a world-class distance athlete. After all, the 1984 Los Angeles Olympics were right around the corner. Little did I know that my Cinderella story was about to end. A mere six weeks after the World Championships, I sustained an injury to my lower back. I was out for a long run and noticed sharp pain in my sacroiliac joint. I saw numerous orthopedic doctors over the course of the next twelve months to no avail. After months of getting cortisone injections into my sacroiliac joints, taking anti-inflammatory pills, and getting chiropractic adjustments, I was still unable to run without pain. I did however continue to maintain a high-fitness level through cycling and swimming. I met Dr. Phil Maffetone in August of 1984 at an event we both appeared at, and the experience was life-changing. Dr. Maffetone told me my problem was due to adrenal stress caused by too much “anaerobic” training. At first I was skeptical, but Dr. Maffetone had me go to the nearest track and run a mile with a heart-rate monitor set to my aerobic threshold. I was shocked to see that I could not run a mile under eleven minutes aerobically: this was unbelievable given the fact that twelve months prior I had run over twenty-six miles consecutively at an average pace per mile of 5: 48! Naturally, I was a bit suspect of Dr. Maffetone’s diagnosis, but at that point I was willing to try anything. Over the next eight weeks, I followed a structured dietary and training plan that he had laid out. The dietary plan basically consisted of incorporating good fats into my diet, eating lots of good protein such as eggs, and avoiding sugar and hydrogenated fats. My training plan consisted of “building an aerobic base” with all workouts (forty-five- to ninety-minute runs) conducted wearing a heart monitor with a focus on keeping my pace to a level where my heart rate would not exceed my aerobic threshold range. Each week, I noticed my pace became quicker as I was able to run faster within my aerobic limits. After eight weeks of base building, he had me enter a 10K race. I was shocked at how easy the race felt. And my finish time was a personal record of 33: 02. Miraculous, I thought, given that a mere eight weeks ago, I could barely run a mile under eleven minutes aerobically and now I was running 6.2 miles at an average pace of 5: 18 per mile! I had a few more successful years of running but then decided to return to college and focus on my career. I retired from serious running in 1988, though I’ve continued to be a participant in endurance. Despite working a demanding full-time job as a business consultant that involves extensive travel and long hours, I’ve completed three Ironman triathlons in the last five years. I still follow Dr. Maffetone’s training philosophies religiously in preparation for these events, conducting all my workouts under my aerobic threshold level and have finished all of these Ironmans under twelve hours— and feeling great! If you are recovering from a major illness or hospitalization, or are regularly taking a medication subtract another 10. If you are coming back from an injury, get two or more bouts of cold or flu per year, have been inconsistent or are just coming back to training subtract another 5. If you have been training consistently (4 times a week) for up to two years without injury or problems mentioned above, keep the number the same (180 – age). If you have been training for more than two years without any problems listed above, and have made progress in competition without injury add 5. For example, I am 33 and I am coming back from an injury so my maximum aerobic heart rate is 142. (180-33-5=142) My training range is 132-142 (10 beats lower than my max). In order to complete the test, begin with a 15 minute warm-up. 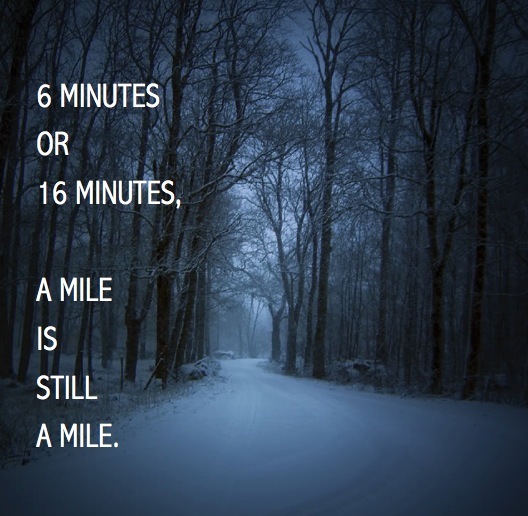 Then complete one mile as fast as you can, while not exceeding your maximum aerobic heart rate. While you may normally be able to run exceptionally fast, you may find that you can’t do one mile that fast while staying below your maximum aerobic heart rate. This is due to the fact that you haven’t built a solid aerobic base. It is eye-opening! So for the next three to four months I am going to be focusing exclusively on heart-rate training and building a solid base through running and biking. I will not be doing strength training, as strength training is anaerobic due to the stress it imposes upon the body. This is also going to be hard for me as I want to get stronger and develop muscle tone, but again I know in the long run this will be to my benefit. Once I start seeing improvements in my aerobic base I will slowly add in strength training. I will continue to do my MAF test every 3-4 weeks, and if I plateau or I am not making progress that is an indication that the strength training is too much stress. I will then back off on the strength training for awhile. This year will be a bit of an experiment, and I will share my results along the way. If any of this piqued your interest I highly recommend reading the book. I downloaded to my Kindle from Amazon for a little over $10.00.